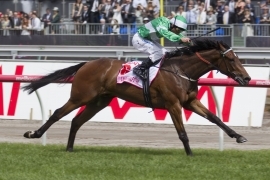 It wouldn’t be a Melbourne Spring Carnival at Flemington without the Cummings name coming to the fore and at this year’s opening day it was Anthony who took the limelight with Fiveandahalfstar winning the day’s $1.5million feature, the Group 1 VRC Victoria Derby (2500m). Fiveandahalfstar ($20,000 2011 Classic, 3g Hotel Grand-Cryptic Miss) was ridden to perfection by champion jockey Damien Oliver, who ensured this year’s Derby was a truly run 2500m staying test, as he knew what he had under him. “He [Fiveandahalfstar] couldn’t have been fitter today, we had a nice run and he just stayed really well. He just outstayed them,” Oliver said. Anthony Cummings bred Fiveandahalfstar using two racehorses he trained, crossing Group 1 winning entire Hotel Grand and winning Snippets mare Cryptic Miss. The resultant colt was put through the 2011 Inglis Sydney Classic Yearling Sale and when bidding stifled Cummings decided to buy the colt for stable clients for just $20,000. Today’s Group 1 victory netted Cummings and fellow owners Julia Ritchie, J Cuvelier, S Wong & H Dyball $900,000 in prizemoney and $10,000 worth of trophies, a long way ahead of the $20,000 bid on the colt as a yearling in Sydney. Cummings was understandably smiling from ear to ear. “I’m really pleased, he’s a nice horse and an above average stayer,” Cummings said. “He’s got a fairly bold running style, much like his old man Hotel Grand, which was like that. “We probably never saw the best of Hotel Grand, he was a real quality racehorse, one the best that I’ve trained, and it’s nice to get one of his youngsters to come here and do the job. From the family of Sydney Cup winner Cross Swords, Fiveandahalfstar completed the 2500m journey in 2:35.92, whipping through the last 600m in 35.19 seconds. He held a one and a half-length margin over Super Cool at the finish with fellow Inglis Select Yearling Sale graduates Rawnaq, Hvasstan, Electric Fusion and Escado the next four over the line. The day got off to a familiar start, with the Bart Cummings trained galloper Lunar Rise carrying the famous black, white and yellow colours to victory in the opening race, the Group 3 VRC Inglis Carbine Club Stakes (1600m). Lunar Rise ($380,000 2011 Easter, 3g Starcraft-Spirited Dancer settled off the hot speed up front and although he copped a few bumps in the run jockey Hugh Bowman remained patient, waiting until well into the straight to unleash the gallopers strong turn of foot to finish ahead of Darley gallopers Tatra, Proverb and Union Gap. The winner stopped the clock at 1:35.30 for the 1600m journey after sprinting home the last 600m in a slick 34.48 seconds on the Dead 4 rated track. Bred by Arrowfield Pastoral, Lunar Rise was a $380,000 purchase by DGR Thoroughbreds from the draft of Arrowfield Stud at the 2011 Inglis Australian Easter Yearling Sale. The Starcraft gelding has now won three of his eight starts and earned $225,950 for owners Dato Tan Chin Nam & Tunku Ahmad Yahaya. “It's nice to have a winner on Derby day and it's nice to win for Chin Nam who's been a loyal client over many, many years,” legendary trainer Bart Cummings said after the race. Lunar Rise’s win was Bart and Chin Nam’s second Group 3 Carbine Club Stakes victory following Saintly’s triumph in the race carrying the same colours in 1995. Saintly progressed the next year to take out the G1 Australia Cup (2000m), G1 WS Cox Plate (2040m) and G1 Melbourne Cup (3200m), but jockey Hugh Bowman believes Lunar Rise’s temperament means he will be better suited at mile events. “He [Lunar Rise] got a bit fired up when we came onto the track, but gave me a beautiful ride mid race. He might get 2000m but the mile is his go at the moment,” Bowman said. Inglis’ Bloodstock team are currently finalising the catalogues for the 2013 Inglis Select Yearling Sale Series. The 2013 Inglis Australian Easter Yearling Sale on April 9 to 11 in Sydney will include a half-sister to Lunar Rise by Arrowfield Stud’s Group 1 winning first season sire Manhattan Rain. The 2013 Inglis Melbourne Premier Yearling Sale on Sunday March 3 to Wednesday March 6 will include a half-brother to Derby runner-up Super Cool by Widden Stud stallion Stratum. The 2013 edition of the Inglis Sydney Classic Yearling Sale, the sale that Derby winner Fiveandahalfstar was offered, will be split over two books. The Summer Book on January 20 & 21 and the Winter Book on June 23.